InfoMap™ is the home of high-detailed maps from different South African regions and neighbouring countries. A brand of paper maps developed and researched for the adventurous traveller, more specifically the traveller that tours by 4 x 4 or by motorbike, for those who demand more from a road map than the ordinary motorist. The Infomap maps are characterised by the combination of geographical information and GPS references. Since its introduction in 1998, with the first decent map of the Richtersveld National Park they have extended their range to 7 maps of different regions of South Africa, and 10 maps of neighbouring countries. 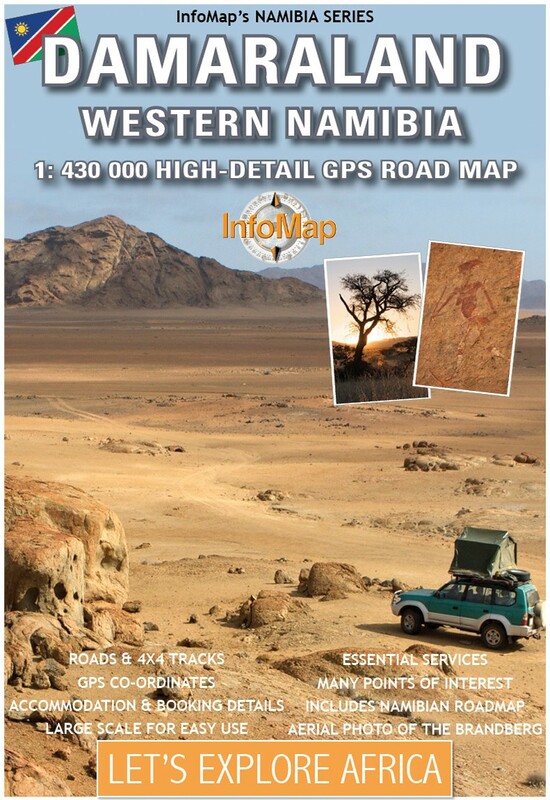 The collection of InfoMap products includes South African Regional maps and Southern African States. With new editions have come some important changes including: new covers, design and updated information. 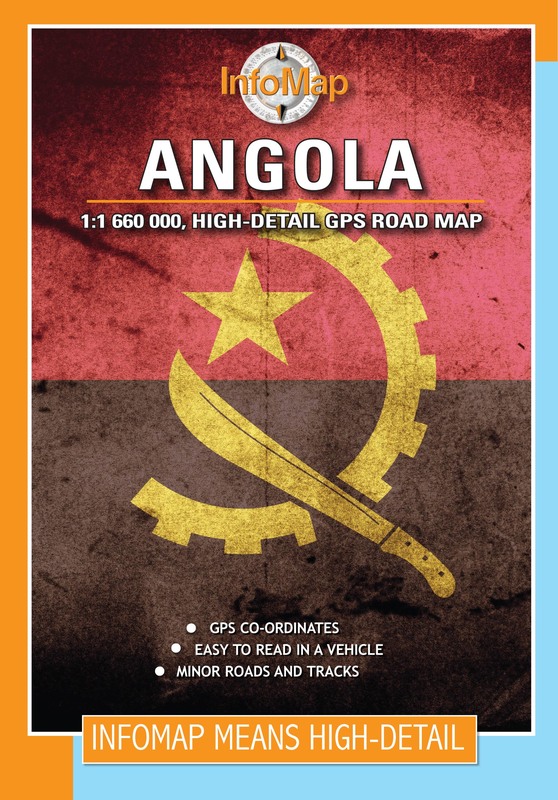 A high-detail road map of Angola with GPS coordinates for important intersections and towns. Angola has been off the tourist map for a long time, due largely to the civil war that raged from 1975 – 2002. Since then the country has come a long way and has made huge efforts in improving or rehabilitating its infrastructure - its roads and railways. Thousands of miles of roadway are now open due to the country’s continuing effort to clear the war-time landmines. At last there is now an updated map available for this exciting and rapidly changing country. The Northern part of the country is printed on one side of the map, while the Southern part is printed on the reverse. The map is sold in a plastic pouch. A classic, now in its 16th edition. 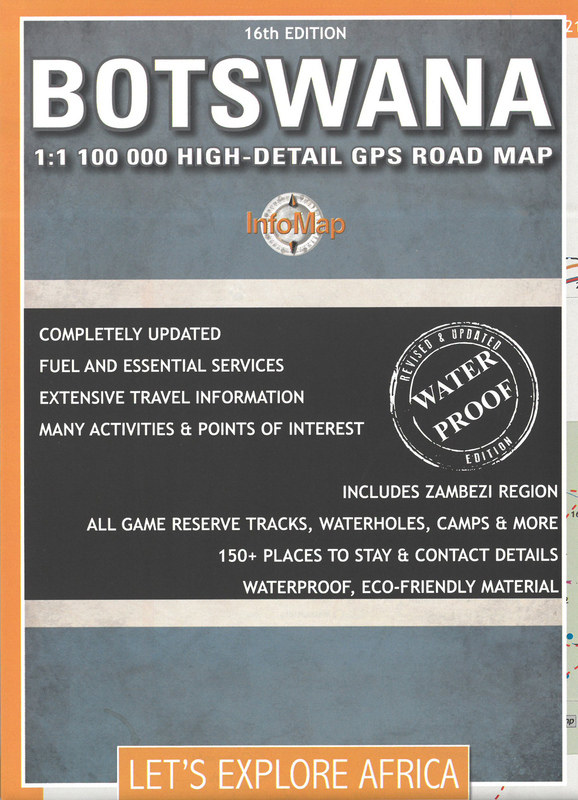 Highly detailed with GPS coordinates and many minor roads, enabling you to discover the beauty of Botswana by yourself. As one of Africa’s most politically and economically stable countries, Botswana is renowned for its wildlife, abundance of national parks and breathtaking wilderness. Visit the Western Woodlands for example, which can be found in larger scale on InfoMap’s 'Kgalagadi Transfrontier Park' map. 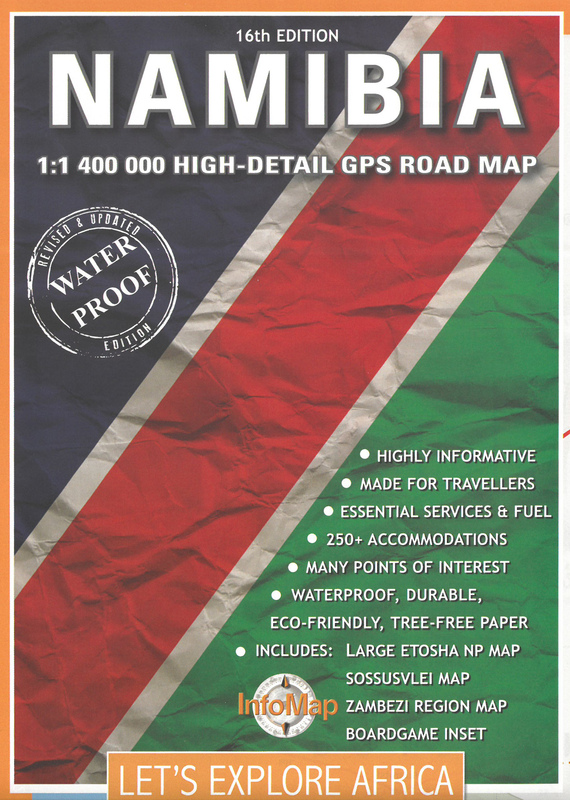 Highly recommended for travelers to these regions as an addition to our larger-scale Namibia map. It offers an amplified look at the region with many GPS coordinates, accommodation options and petrol points. Included are also extensive route and travel ideas, as well as general information on Kaokoland. This edition boasts some new tracks that have been added thanks to the assistance and extensive knowledge of the area by travel writer Johan Snyman. Highly detailed road map with minor roads and tracks, GPS coordinates of important intersections and places of interest and accommodation information. 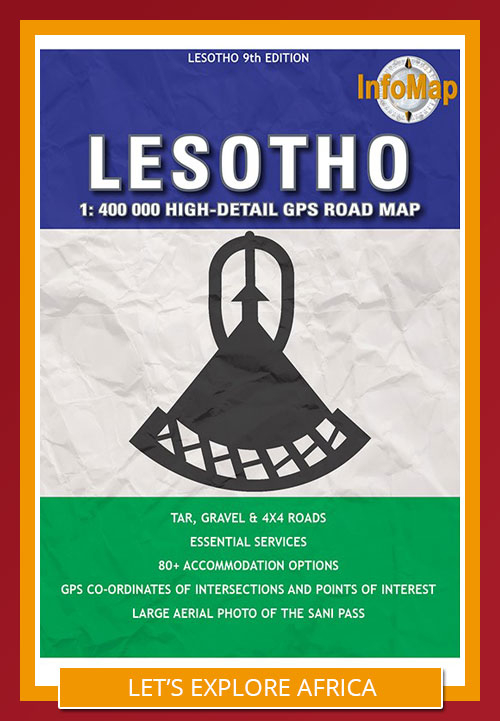 This map includes extensive information on travelling in Lesotho such as 'Crossing the Border', 'Camping and Security', 'Health', 'Currency', 'Topography and Climate'. The Sani Pass is expected to be tarred in the near future, and would then lose its fame as one of the most challenging passes in Southern Africa. Maybe it's worth planning a visit so as to drive the pass before this happens! A high-detail road map. Well researched. This 7th edition has been completely redesigned and updated. 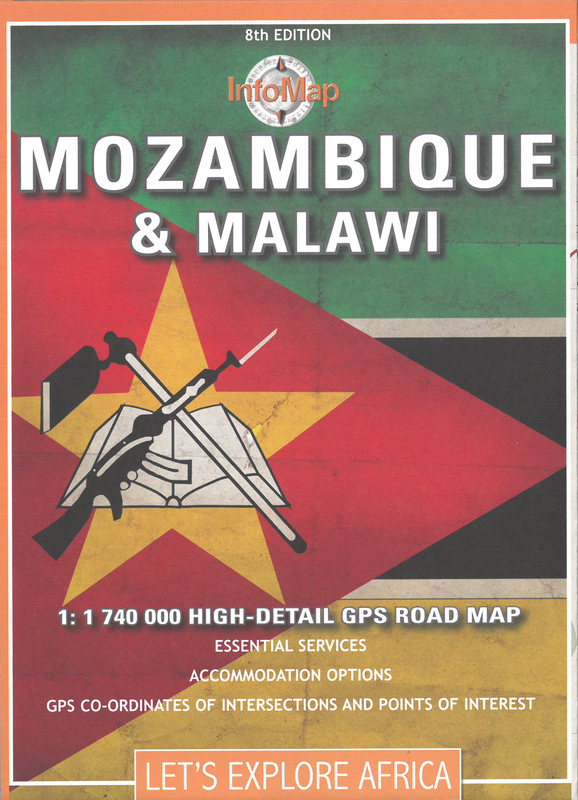 Contains GPS coordinates, accommodation information, a street map of Maputo and enlarged inserts of the Maputo to Ponta do Ouro area and Inhambane resorts. It also includes Mozambique’s Northwestern neighbor, Malawi, with destinations including national parks, mountain hikes and the countrys gem - Lake Malawi. One side of the map shows Northern Mozambique and Malawi. Southern Mozambique is on the reverse side. 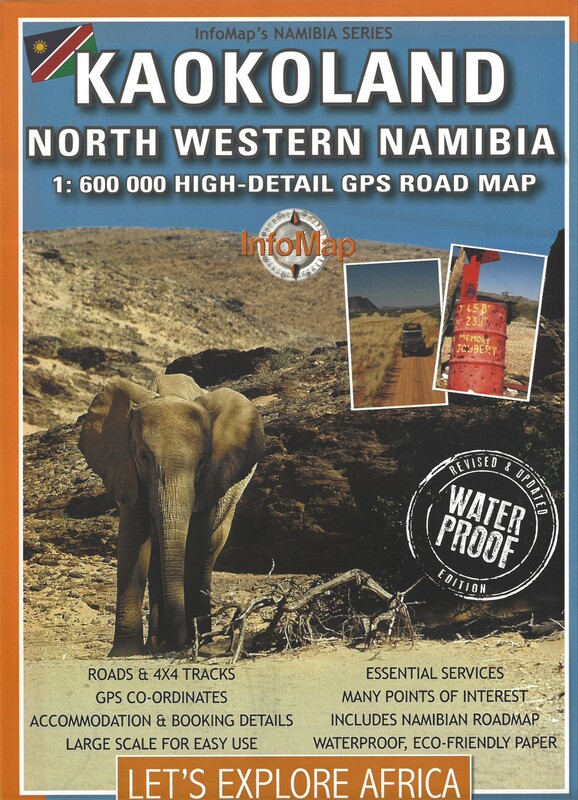 A great planning tool and on-the-road resource this 15th edition Namibia map includes a number of important, useful changes from the old edition. Changes include adding a large detailed inset of Etosha National Park – Namibia's most visited tourist 'attraction'. The inset lists roads, waterholes, accommodation, viewpoints, picnic sites, gates, GPS points and services in both the Eastern and newly opened Western region of Etosha too. More detail has been added to other areas such as the Khaudum National Park. More information relating to Sossusvlei and the northern Naukluft regions has been included as well. This detail also includes useful on-the-map commentary concerning road conditions, access permits, good sites for birding and other helpful insights. These additions, together with more listed GPS points, are aimed at improving the maps overall usability. A new feature on the map is the listing of services. These include shops, banks, vehicle repairs and hospitals. The map also now includes over 250 places to stay, listed by accommodation type and price per night. These are located on the map, with contact details and GPS co-ordinates listed in two info-blocks. This map is aimed at filling the gap in Namibia’s large self-drive tourism market, as a reliable, practical, informative, one-stop tool. An important addition to this map is the free printable, digital (PDF) guidebook which customers can download. This 3rd edition has been completely re-designed and updated making a visit to this tiny yet very special country so much easier. 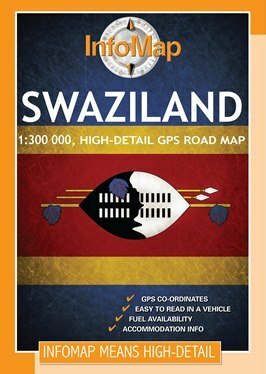 Highly detailed road map with GPS coordinates, points of interest and border posts. It also includes all the accommodation and booking information for the national parks, as well as many highly recommended accommodation choices all over the country. 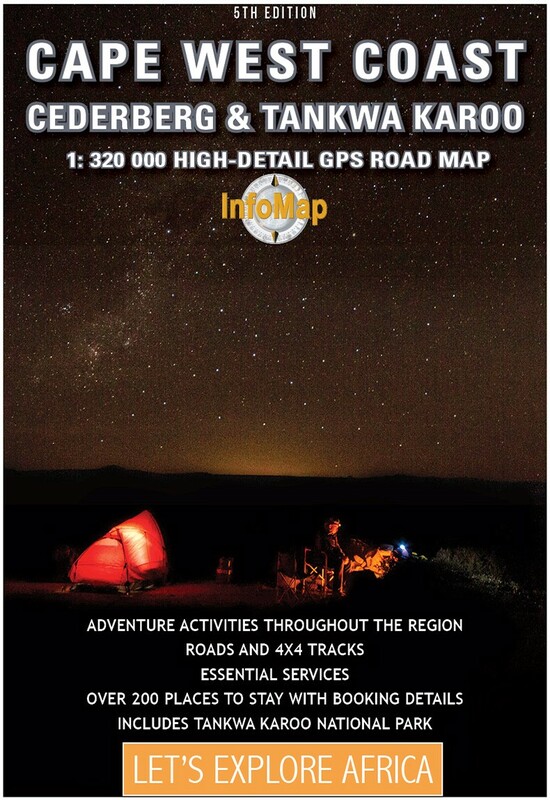 Highly detailed road map with GPS coordinates and accommodation information. 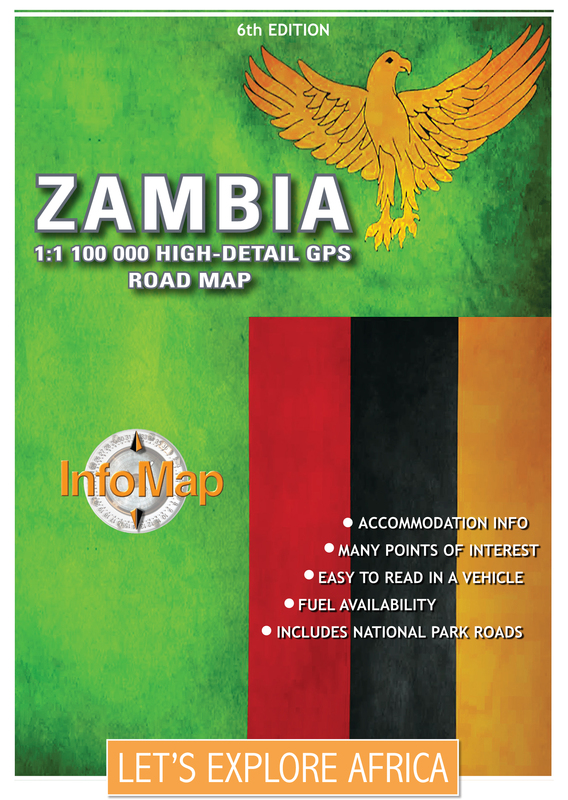 This 6th edition of the Zambia map has been thoroughly edited, updated and improved upon. Infrastructure development is happening fairly rapidly in Zambia, with many roads being tarred and upgraded and new bridges being built. It is becoming both quicker and easier now to get to the country’s national parks. With 19 national parks including the world famous Kafue and South Luangwa National Parks, Zambia is an exciting wildlife and touring destination. Find all the information on this map. One side shows the Eastern part of the country. The Western area is printed on the reverse. This 4th edition is filled with practical information and has been researched and produced with the aim of getting travellers to better explore this Southern African country. Changes include road conditions, GPS coordinates, useful travel information, accommodation listing, tourist activities and much more. 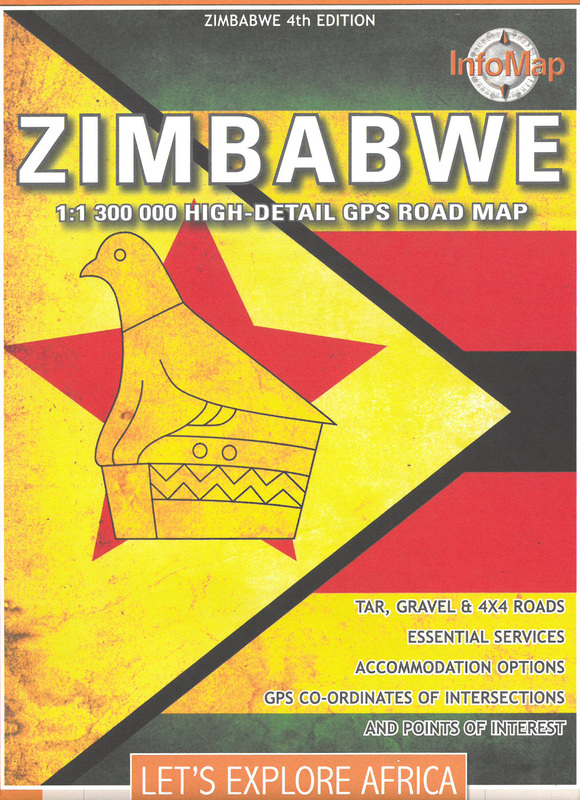 There is also a street map of Harare and of Victoria Falls included. This one-stop travel resource is more than just a roadmap, it is a pre-planning tool and practical on-the-road resource for both the casual and adventurous traveller. 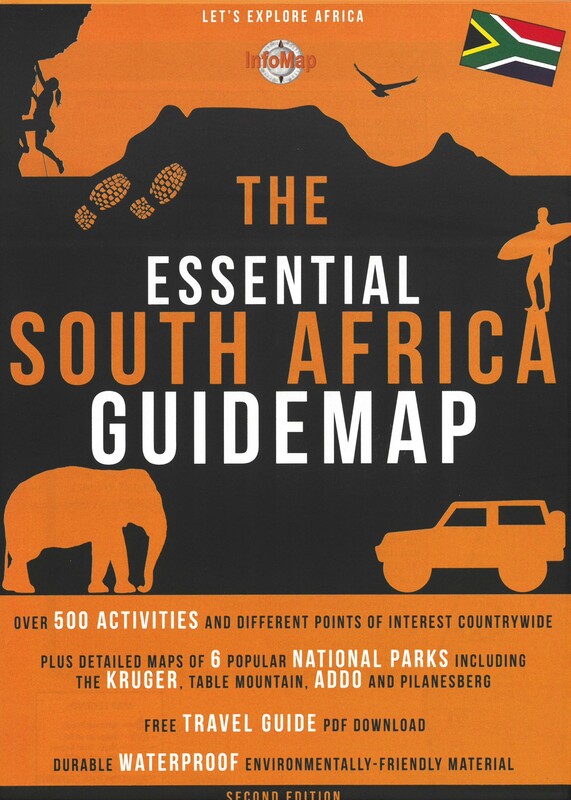 This new Essential South Africa GuideMap is a unique all-in-one South African travelling resource. The roadmap is found on one side and is scaled at 1:2 000 000. This map identifies over 500 of the top activities and places-to-see throughout SA. These include the best sites for various adventure activities including surfing, kite surfing, shark diving and bungee jumping. This side of the map also includes useful services such as fuel, banks and vehicle repairs. It also locates private hospitals across the country. All this travel information is shown on the map using icons. On the reverse side are shown 6 of the most visited National Parks, including Table Mountain, Kruger, Addo, Pilanesberg, Augrabies and Hluhluwe-Imfolozi. The maps show details for roads, accommodation, toilets, viewpoints, picnic sites and other points of interest. They also give useful travel information, accommodation details and emergency contact details for all the parks listed. The information on the map is detailed in a free 40+ page digital (PDF) guidebook that customers can download from the InfoMap website. The map covers the West Coast of South Africa, from Yzerfontein up to Lutzville in the north, and to Sutherland in the east. It also includes the Tankwa Karoo, east of the Cederberg, with its many dirt roads and tracks for biking and gravel travel fans. A highlight is the Tankwa Karoo National Park, with its rugged landscapes and wide range of accommodation options. 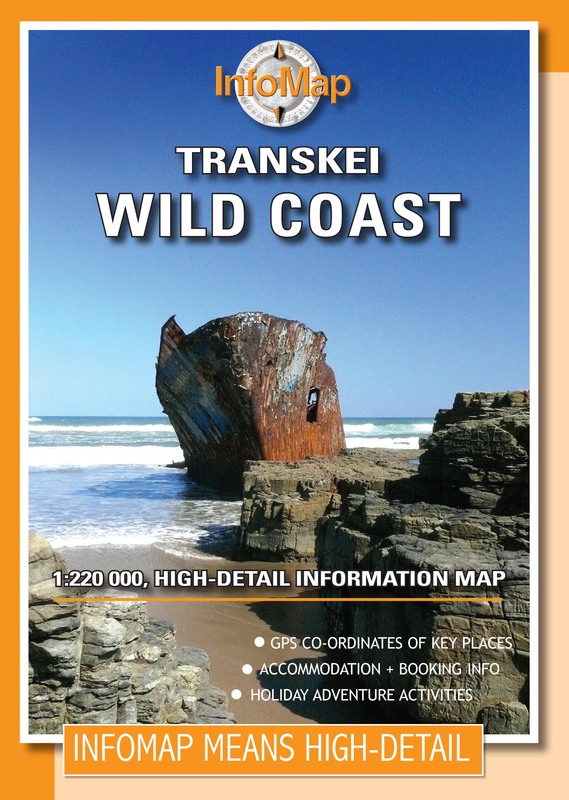 High detail map with GPS coordinates of key places, accommodation, booking information and holiday adventure activities. One side of the map shows the Western area; the Eastern area is featured on the reverse. High detail map with GPS coordinates of key places, accommodation (with contact details), off-road tracks and many other intersections. The map also contains fuel points, vehicle repairs, distances and many points of interest. Damaraland is an ancient, vast and rugged region of high mountains, deep valleys and arid dramatic landscapes, located north of Swakopmund in north-western Namibia. The area has some large wildlife consessions and is home of the uniquely adapted desert elephant which can travel for a few days without water, rhino, lion, giraffe, kudu, oryx, zebra, springbok and other animals. Damaraland is an untamed wilderness offering various opportunities to travellers from luxury lodges to serious self-sufficient camping. High detail map with GPS coordinates of key places, accommodation, booking info, and holiday adventure activities. One side of the map shows the Eastern Freestate. 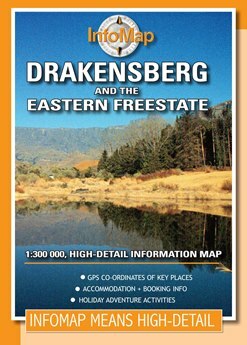 The Drakensberg section is printed on the reverse. The Kgalagadi Transfrontier Park is the product of the unification of South Africa's Kalahari Gemsbok National Park and Botswana's Gemsbok National Park. This is an area of uniquely beautiful wilderness that offers something for every taste in comfort levels. 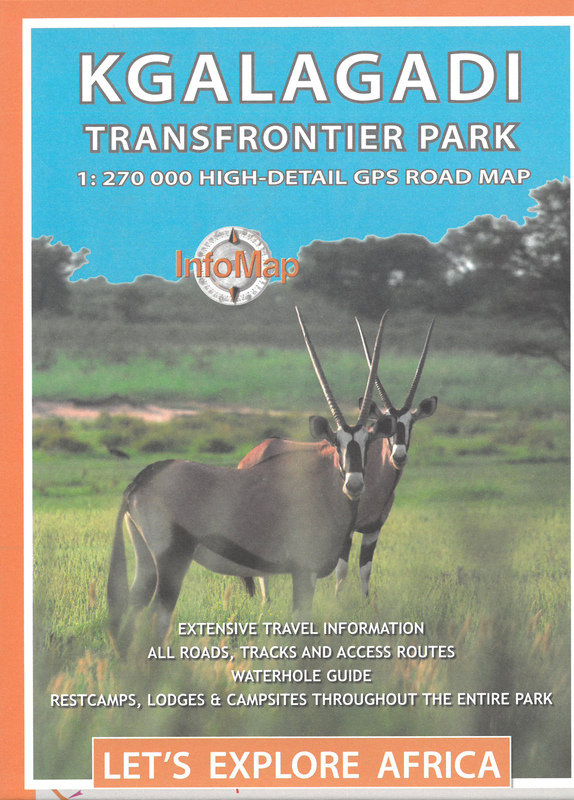 The map covers both the popular South African side as well as the less travelled Botswana side - with a wide range of information including route information, waterholes, services, campsites conditions, distances, pans, border information and a whole lot more. The traveller can make use of the well established and well maintained infrastructure and roads on the South African side of the Park, including rest camps that offer all luxuries; or rough it on the Botswana side with deep sandy tracks and unfenced camping sites. Apart from the park itself, the map covers the immediate surrounding with emphasis on the area north in Western Botswana between Hukuntsi and Ukhwi. Known as the Western Woodlands this is a remote and wild paradise ideal for the 4x4 enthusiast. The map is sold in a plastic pouch and this new edition is printed on waterproof paper. 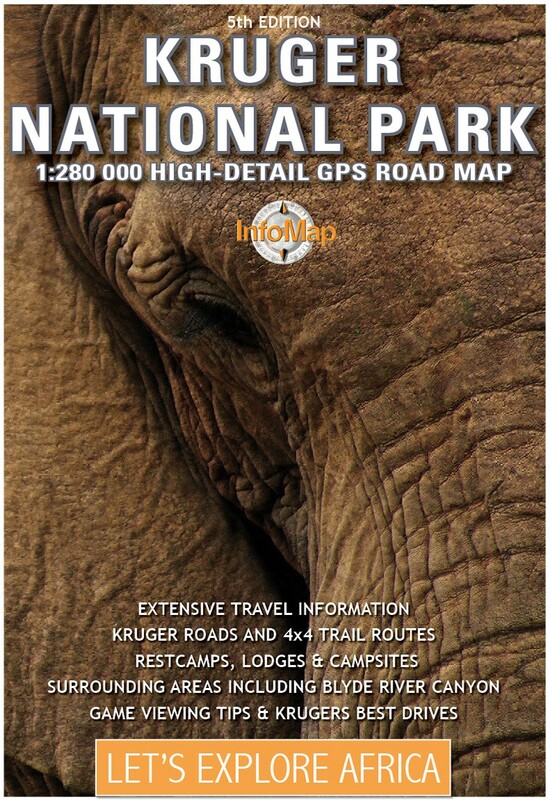 One of InfoMap’s more popular maps, this is an updated and redesigned version of the older Kruger National Park map. Contains in-depth information regarding roads and infrastructure. Info-blocks inform the traveller about 4x4 trails, booking information, best drives and more. It also includes a list with a number of highly recommended accommodation options outside the Kruger National Park, as well as the Parque Nacional Do Limpopo or Limpopo National Park across the border in Mozambique. In its 8th edition, this map remains as popular as ever. 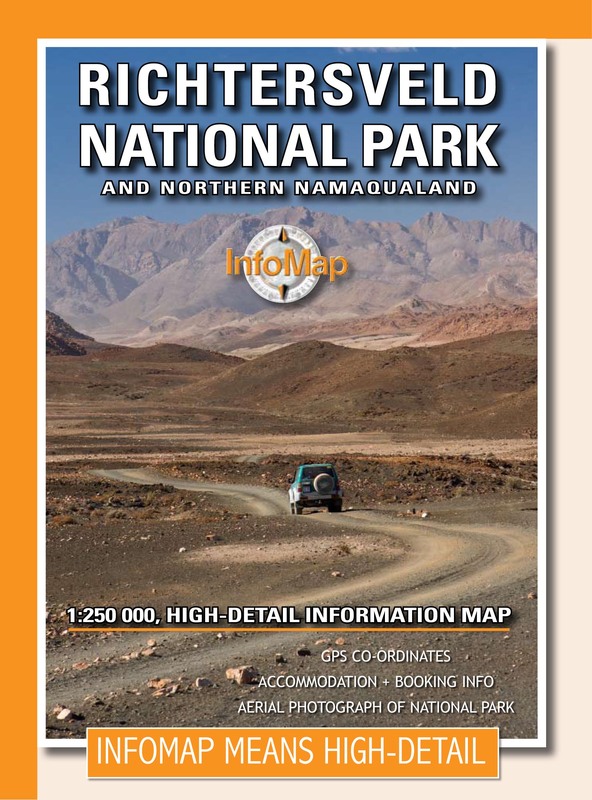 Includes the usual GPS coordinates, accommodation and booking information PLUS a large-scale aerial photograph of the National Park on the back of the map with road overlay. This map gives a very good idea as to the type of terrain and harshness of the landscape that you will be tackling. The map covers the Wild Coast from The Kei River mouth to Mbotyi north of Port St. Johns. With GPS coordinates of key places, accommodation, booking information and holiday adventure activities.